Often when we think of tithing, we think of dropping notes and coins into the church offering box on Sundays. Sometimes we also consider financial donations to different ministries, missions, or NGO groups. Yet when we look back at the Old Testament, there was a lot of emphasis placed on sacrificing physical items, or leaving part of the harvest behind in the field for the poor to collect. Society seems to have become used to financial donations and we often don’t pause to consider what else we could give. Part of this is that, due to the nature of the world’s financially structuring, its often the simplest way. But another part of it is also that we no longer think creatively about how we can give. We also don’t want to donate what is often the most precious commodity in our overly-busy lives – our TIME. Our time to think about how we could give, or our time offered in acts of service. Living in Africa, the cry of “But we have no money” is heard far too often. I often attend churches where they profess their greatest need to be a sound system, guitar and drum kit, rather than resources, or items that will enable them to help their community (traditionally, there is a large focus on evangelism in this area, but limited focus on discipleship). Even churches that now have small things that they could give, often keep the mindset of being poor. It’s time that we start thinking more creatively about how and what we can give; as individuals, missions and businesses! I’ve been encouraged this week by examples of this. A few of us were discussing how we can give to each other’s ministries in physical ways, rather than just financially (a constant struggle). As I began to think of what the School of Biblical Studies (SBS) could give out, we were blessed to be the recipients of such giving. As the new school on campus (I’m part of the team about to pioneer the School of Biblical Studies here at YWAM Rwanda), we have been the recipients of the creative giving. First, I was delighted to receive an email from a friend who is donating study resources – and a chain of people are donating time to pass it on from one person to the next, until it arrives with the one donating space from her suitcase to fly it over for me. 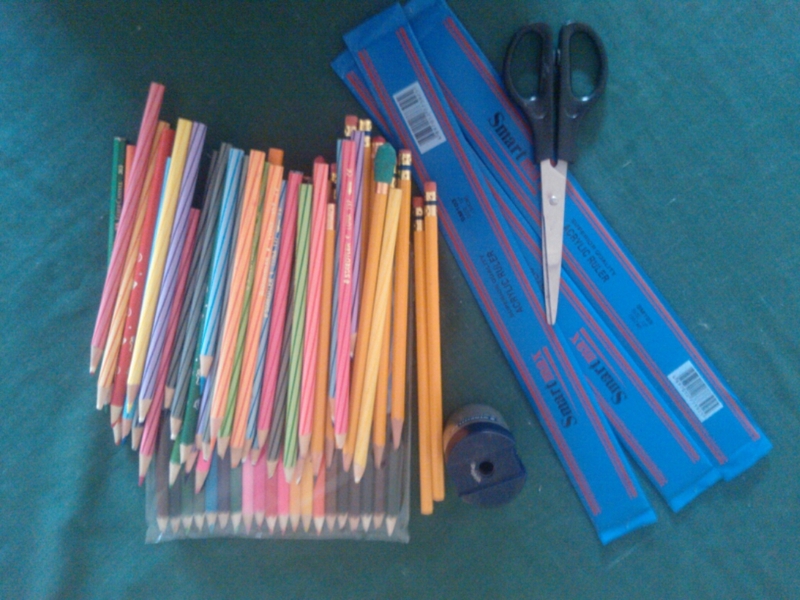 Also tied to the SBS, just this morning, I was given a donation of pencils and other stationary items from a school ministry. What I love about this is that it even looked like the tradition way of thinking of a tithe: they had received a suitcase full of stationary items as a blessing from a visiting team and chose in turn to share their blessing with us. A few weeks ago I wrote about a small village church in the DRCongo where the poor congregation dropped single coins into the offering box, worth less than 50c. I don’t think I mentioned that some of them, who did not have money to give, gave from their crop. I also don’t think that I mentioned how the pastor has a land plot he has set aside for a church garden to support the needs of his congregation. I am sure that many of you are already creatively giving and I encourage you to pause and think about the ways you are doing so. I pray that as you think of how you are giving, your heart will be warmed and you will feel a lessening of the burden to “do everything”. And I also want to encourage you to think of ways that you can give this month that isn’t solely financial. Do you have a lot of old school books at home that you could donate? Do you have clothes you can give away? Could you invite a poor family in your community for dinner, or make a meal for the first-time parents on your street? Is there a charity overseas that you feel connected to that you could write to and see what items you might be able to arrange to be sent for them, or is there a mission group close to home that you could start serving at for two hours each week? Be blessed, and may you experience the joy of giving.